RiverQuest EXPLORER is docked on the Ohio River next to the submarine at the Carnegie Science Center. 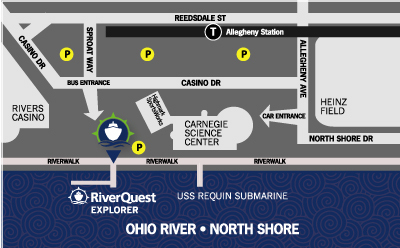 Access to the dock is through the Carnegie Science Center Visitor Parking lot and/or along the riverfront path. NOTE: There is a charge to park in Carnegie Science Center lots. Special parking rates apply for special events such as Pitt Panther games, Steelers games and Pirates game days. Make a left after the ticket machine and park as close to river as possible. 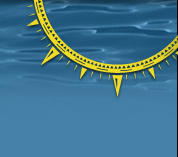 Locate the paved river path, and the dock will be to the right of the submarine.